Meet others, find support, and have fun! Join us for positive support and fun! OASOS is for Lesbian, Gay, Bisexual, Transgender, Questioning, Intersex, and Asexual (LGBTQIA+) youth 13-18 (12 with parent/guardian permission). OASOS stands for Open and Affirming Sexual Orientation and gender identity Support. Please call 303-870-7039 for more information. 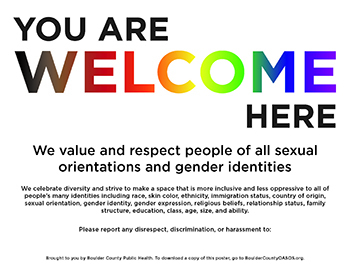 Click on the image above to download free posters to help let people know that your space is welcoming.